I am a music therapist working with adults who have a learning disability. 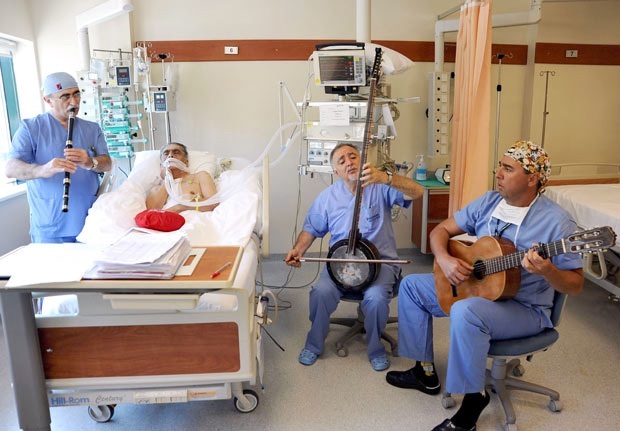 For thirty years, I have observed the physical, social and psychological benefits of making music (singing and playing instruments) with often very withdrawn and isolated people. Music therapy is about reaching out and the most special moments are when people connect with me, and with each other, through music. It still thrills me when sharing a guitar draws a moments eye-contact from a very withdrawn person, or when, by first supporting their music-making and then by encouraging them to explore new ways of expressing themselves, there in a growing sense of synchronicity as I play music either with one or with a small group of clients.That’s an active approach to music therapy, but I have always been very aware of the treatment potential of something as relatively simple and, with the advent of MP3 players, remarkably inexpensive as listening to music (or, to give it its correct title, receptive music therapy). During my postgraduate training (1984-85) I was immediately struck by the way music therapy changed behaviour. It was then I first became aware that music could engage withdrawn and unmotivated people. It was then I first became aware that both singing and playing an instrument provided ways of developing non-musical skills that enhanced social, communicative and physical abilities. At the time (1985), I wrote this about Christine. “Christine had been a patient in a large institution for mentally handicapped adults for over twenty years, and lacking stimulation from and effect on her environment she had become unmotivated and withdrawn. In music therapy I found that she responded to nursery songs and sang with me as I played on the piano. She had suffered a road traffic accident at six years of age which accounted for this response. It was interesting to observe how her behaviour changed when given a microphone to increase the volume of the sound she produced. Suddenly aware that she was having some affect and success in this situation a volte-face occurred – she became very motivated and less withdrawn”. However, an afternoon with Mark on my first placement in a large psychiatric hospital made the greatest impression. On that occasion, I noted how people often became more relaxed and less agitated as they listened to music. At the time (1984), I wrote this about Mark. “Mark was on an admission ward, he was about twenty-years-old and amazingly tense – like a coiled spring in fact. Nevertheless, it was encouraging to see him relax as the therapist played Bach’s ‘Jesu Joy of Man’s Desiring’ on the piano. His hands, that had been rigid, curved naturally. All the tension left his face and with his eyes closed he moved from side to side in time with the music”. I was convinced then that receptive, listening, music therapy was a valuable intervention, and I remain convinced. 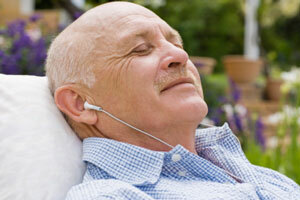 Consequently, I have used receptive music therapy throughout my time as a clinician. I have found that it can alleviate an individual’s anxiety as they first become involved in music therapy and that it can have a calming influence when someone is over stimulated or agitated. I have completed several investigations examining the impact of music therapy, both active and receptive, on people with a learning disability. These investigations culminated in a substantial piece of work that demonstrated some value in introducing calming music into the mealtime environment at a time when people with a learning disability are more anxious. I am an advocate of receptive music therapy and, as such, I have been encouraged to read how music listening is being used with people at both ends of the age spectrum. At one end of the scale lullabies are being used to reduce the pain experienced by babies with cardiac and/or respiratory problems, while at the other Playlist for Life is transforming the lives of people with dementia and their carers. It helps rebuild relationships by using MP3 players to relay carefully chosen music of special significance to the dementia sufferer. Furthermore, although effectiveness data is mixed, there is a growing belief that post-operative pain can be eased by the distraction of listening to your favourite music and consequently it is recommended in acute pain management guidelines as a way of managing moderate postoperative pain in conjunction with opioids. The study of health behaviour has focused on behaviours that protect health. These behavioural immunogens are lifestyle choices or patterns of behaviours associated with greater longevity and decreased risk for illness. They are things like not smoking, brushing your teeth, getting regular exercise, using safety belts, good sleeping habits and so on. I wonder, given the widening application of music listening, should it be added to this list so that the interventions presented in these pictures become more common place? This entry was posted in Uncategorized and tagged anxiety, hospital, learning disabilties, listening, music, music therapy, singing. Bookmark the permalink. I remember many years ago seeing music therapy in action in Strathmartine Hospital, probably was you Jeff that led the group. Was a group of people with very severe mental and physical disabilities and they were ” dancing” to the music by moving their eyes. They connected to the music and communicated with their dance – I’ll never forget that.